Zermatt & Matterhorn area – with private tourguide – starts from Bern. Visit the mountain resort village of Zermatt with your private tourguide and spend a day in Zermatt and on mount Gornergrat. Enjoy the perfect view to mount Matterhorn all day long on this sighseeing tour. 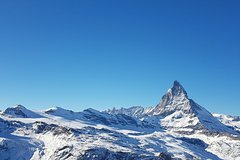 You will start with a walk around in Zermatt and get information about the history of the village and the influence of alpine tourism as well as the ascent to mount Matterhorn. Afterwards board the scenic coghwheel railway to Gornergrat and enjoy views to mount Matterhorn, the glacier Monte Rosa and the surrounding summits on 2800m above sea level. Get a feeling of mountain climbing while visiting the museum in Zermatt later in the afternoon.